Part of my professional growth plan is focused on building a positive school staff culture. I am no expert in this area but I have been honoured to learn from many others to help with my growth. It is my belief that one of our main roles as principals is to create the conditions for a positive culture. I will be using my blog to share and reflect on my learning journey. I have been privileged to work at two different schools in the past 10 years each having their own organizational culture. Culture is something that is hard to see but we can always feel; it is the vibe of a school – the beliefs, attitudes, and behaviours that exist within a school staff. In order to create change in a school, we need to work as a staff to create a positive school culture. As Peter Drucker says, “Culture eats strategy for breakfast” so before we can talk about driving real change and having deep reflective conversations, we need to change the behaviours to change the culture. So how do we do this? At James Hill, our staff has focused on building positive staff culture for the past few years. Our goal was to build school culture, not by isolated team-building activities but through the important work we do together. To ensure we were acknowledging the importance of behaviours, we started with creating some norms or commitments for our staff meetings and collaborative time (Hat tip to Cale Birk for the idea). The staff came up with the list below and I am sure you can see some themes that arise from the list. This set of commitments guides our behaviours and has helped create an environment where the staff meetings are a place safe enough to have those conversations that often take place in the parking lots and staff rooms. Prior to a discussion that may have some opposing views, we remind ourselves of these commitments. More recently, we have talked about the attributes of an effective staff culture. 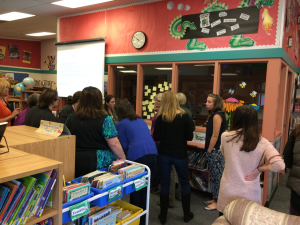 Staff shared their experiences both in a positive culture as well as a negative culture. 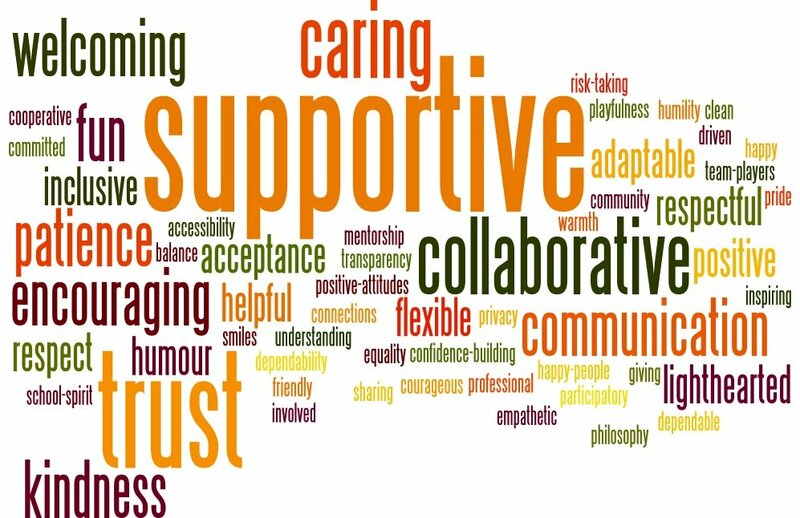 They then captured words to describe a positive culture and the words were put into a wordle (Hat tip to Suzanne Hoffman for the idea). As you can see, these four pillars are also based on the values of trust, happiness, curiosity, and care. These values weave their way through all four pillars and without them, the pillars can crumble. In future posts, I will go through the pillars and values in more detail but here is a summary of the 4 pillars. A strength-based culture is one that believes that EVERY staff member has strengths that can be tapped into to benefit the school as a whole. Feedback with staff always starts with strengths (characters and skills), staff memebrs are given the opportunity to determine their strengths, and each staff member is encouraged to use these strengths in the important work with students. A collaborative culture is one that believes the “smartest person in the room is the room itself” (David Weinberger). Staff tap into the strengths of each other and engage in reflective dialogue to drive professional learning forward and create positive change. Trust is a huge part of a collaborative culture and a big change we wanted to make was to move the “parking lot conversations” into the staff meetings. Truly listening to others is such an important way to build trust and a collaborative culture. An innovative culture is one in which educators feel safe to take risks, think critically and creatively, and implement new ideas with support. An important shift we have tried to make is moving from the question, “Can we….” to the question, “HOW can we…” An important role for principals is to work to provide the resources (time, materials, etc) to build an innovative culture and help good educators become great educators. A focused culture is one that knows the key areas of growth that the school is working on as well as the strategies that can have the most impact in the classroom. With so many ideas, policies, and procedures being sent our way, it is important to be a good filter and keep the staff focused on they vision and mission. This continues to be my highest area of needed growth. The aforementioned pillars are based on important values of trust, happiness, curiosity, and care that not only guide our behaviours but also guide our journey toward a positive school culture. 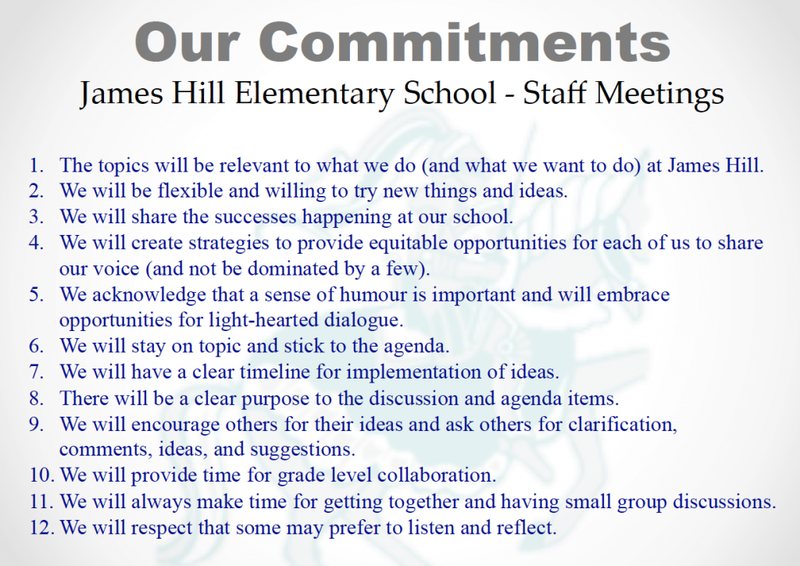 At James Hill, we have had our challenges but have made huge strides in moving toward a positive staff culture. This year has provided so many examples of a staff that sees the strengths in each other (and taps into this), collaborates in scheduled meetings as well as on their own time, and is willing to take more risks to bring new ideas to the classrooms. With a revised curriculum in BC, focus has been a challenge for us but we will continue to grow in this area as we use the other three pillars to help create more focus on our mission and goals as a school. I look forward to reflecting and sharing not only my learning but also our growth as a school organization to continually become a more positive school culture.